SKU: GN90. Category: GLOVES, Nitrile Gloves. 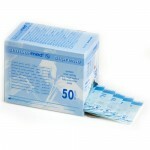 GN90 Micron Blue Powder Free Nitrile Gloves, supplied in a box of 200. These Blue Nitrile Powder Free examination gloves are rigorously tested to comply with Medical Devices Directive 93/42/EEC and also tested to European Standards EN455 parts 1, 2 and 3, EN388 and EN374. 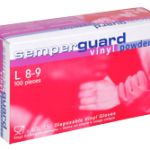 Designed for performing medical procedures, these powder free nitrile gloves are strong, high quality and dependable. The gloves are carefully inspected for holes and other minor defects. Random samples of the gloves are filled with 1000 ml of water and then examined for leaks. Gloves are tested to AQL 1.5 standard after their manufacture from nitrile butadiene. They are also mildly chlorinated and thoroughly washed. Typical force at breaking point is 9 Newtons. Typical elongation before breaking is 600%.